It’s no secret that many people were disappointed by “S.H.I.E.L.D’s” first season. People wanted it to be as awesome as a Marvel movie, but instead it chose to tell (slightly) more human stories and unravel its central mysteries in the slowest ways possible. Then H.Y.D.R.A invaded S.H.I.E.L.D in “Captain America 2,” causing all hell to break loose in Marvel’s TV universe. Suddenly Agent Coulson and his team were the enemy of the U.S. government, and the S.H.I.E.L.D infrastructure the team had employed all season was broken beyond repair. It pumped some adrenaline into a stagnant show, and led to the back half of the first season being much more fun than what preceded it. A few major questions were left dangling at the end of Season 1. Could “S.H.I.E.L.D.” keep up the momentum sparked by “The Winter Soldier?” How will team dynamics change now that Coulson is the new S.H.I.E.L.D director? What’s up with Skye’s dad? Will Fitz ever be the same after almost drowning? And, most importantly, is H.Y.D.R.A really dead, or is it just back into hiding? Well if this episode is any indication, “S.H.I.E.L.D” is back and better than ever. Everything about it just oozes a confidence that wasn’t there in the early goings of Season 1. The biggest difference is Skye: She’s now a certified badass who can go into the field with May and Triplette without being a liability. Not having to baby her anymore will definitely make this team feel more like a legitimate threat to the bad guys going forward. 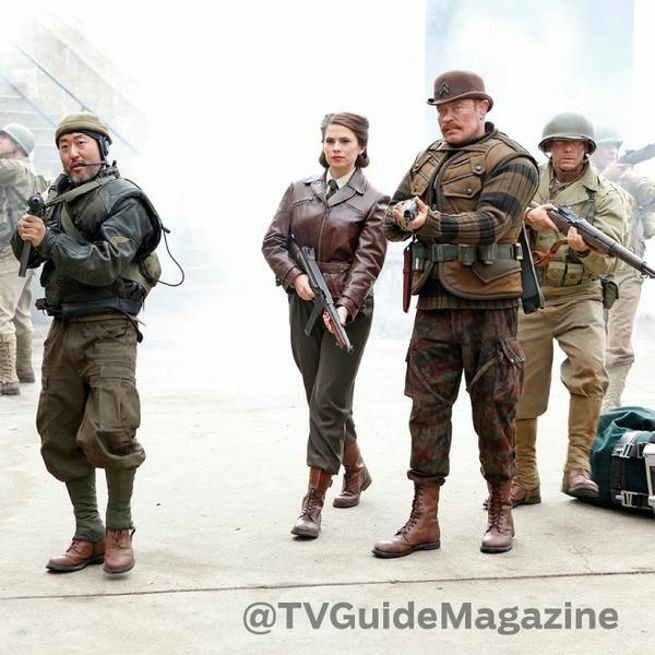 The premiere picked up with a nifty flashback to World War II with some great cameos, including Hayley Atwell’s Peggy Carter (who’s getting her own show soon, which I will definitely check out). We see and her team take down a H.Y.D.R.A outpost captained by NAZI Commander Daniel Whitehall (Reed Diamond) and recover a few mysterious artifacts. Spoiler alert: Everything about this flashback comes back to haunt our favorite S.H.I.E.L.D agents. The team has grown since the end of last season. In addition to Skye, May, Fitz and Simmons (more on her later), the team has brought on a group of mercenaries led by Isabelle Hartley (Lucy Lawless). Coulson is overseeing everything with the help of Agent Koenig (Patton Oswalt), or all the Agent Koenigs. I have no idea how many Agent Koenigs there actually are, but I get the feeling we’ll be finding more about him and all his “brothers” eventually. This episode revolved around an artifact from the flashback, one with some serious crazy powers. The artifact was being sought by a certain Carl Creel, aka The Absorbing Man, aka by far the most terrifying physical threat anyone has faced on this show yet besides Deathlok. It took a lot to take him down, and by the end of the episode he was still very much in play. Good luck dealing with him, guys. Is “S.H.I.E.L.D” going to try to redeem Agent Ward? God I hope not. The H.Y.D.R.A twist with him last season was fantastic, and trying to make him into a good guy again would ruin the impact of his betrayal. Where is Simmons? She was last season’s secret MVP, I need more of her! How long can Fitz stay with the team? The poor guy has been through a lot, but his brain just isn’t what it used to be. His memory is shot, and he’s talking to a ghost Simmons. Either he’s going to start remembering how to be a genius again, or Coulson might have to make a tough decision. What the hell did that rock do to Hartley’s arm? Based on how it and the Orb from “Guardians of the Galaxy” had a similar effect on puny humans, my money’s on it being the fourth infinity stone (we’ve already seen the Tesseract, the Ether and the aforementioned Orb). Also, there’s no way Hartley is really dead, right? How the hall is Daniel Whitehall not only still alive, but also looking exactly like he did during his NAZI heyday? And what does he want with this infinity stone (it has to be, it just has to!)? That’s a lot of questions to keep this show busy for a while. If the villains keep being as entertaining as The Absorbing Man and we develop the new characters a bit more, there’s no reason Season 2 of “S.H.I.E.L.D” can’t establish itself as one of TV’s heavy hitters.